As the Grants Manager for Museum of Glass, I spend my days writing, creating budgets, strategizing, and researching. I came to this job on a winding path, however, and that path included taking a glassblowing class in High School twenty years ago. So when given the opportunity to be the “Hot Shop Intern for a Day”, I jumped at the chance! I love glassblowing; it is the reason I work at Museum of Glass. I love the immediacy, the teamwork, and the sublime sensuality of the material. On the day of my internship, I arrived with chocolate chip cookies for the team to thank them for the opportunity. They were very appreciative. Before the Museum opened, the real Hot Shop Intern, a UWT student, Danny, showed me the ropes. I was going to be operating the doors of the glory hole. No problem, I thought. I can do this. The glory hole has three sets of doors each larger than the last. The doors are opened as the artist brings the piece to be heated, and then closed as the piece is brought back to the gaffer’s bench to be worked. Open, close. Open, close. Repeat. Repeat. You might think this sounds boring, but I had the greatest time operating those doors! I got to see really up close what Ben, Gabe, and Niko were making, and how effortless they make blowing and sculpting glass look. I got to hear them sing along to terrible easy listening hits of the 1970s and 1980s (think Hall and Oats and Toto)—they know ALL the words—it was hilarious. I got to listen to them communicate to each other in a strange shorthand language as they created each piece. I got to feel like a member of the team. My day as a Hot Shop Intern inspired me. It inspired me to find more humor in my days; to find more joy in my work; and to remember just what my work at Museum of Glass supports—the endurance of the creative spirit. It was the best day I’ve had in a really long time. Hannah Fields talking to Visiting Artist Barbara Earl Thomas while working in the Hot Shop. 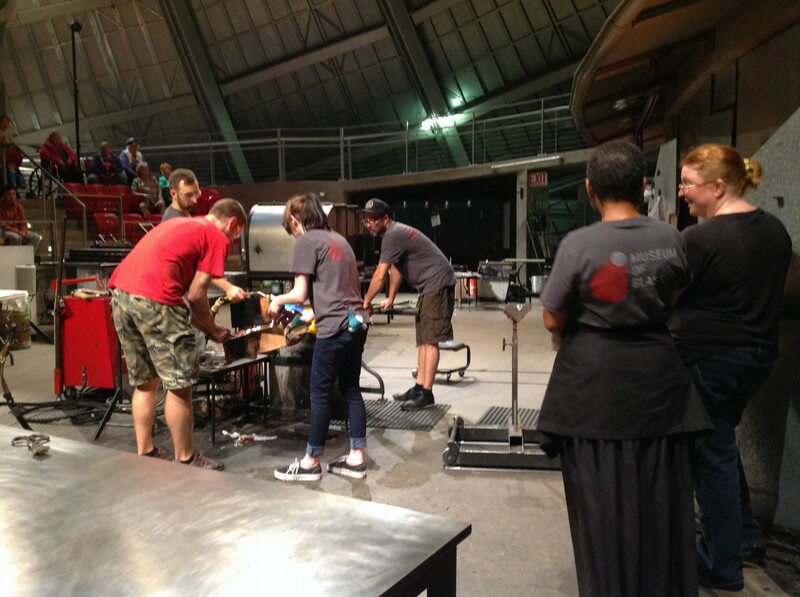 Thank you to the amazing Hot Shop team for making me feel so welcome in their home and for sharing their spirit of generosity, humor, teamwork, and fun. This entry was posted in Hot Shop, Museums and tagged Barbara Earl Thomas, glass art, Hot Shop, MoG, Museum of Glass on October 6, 2014 by Museum of Glass.